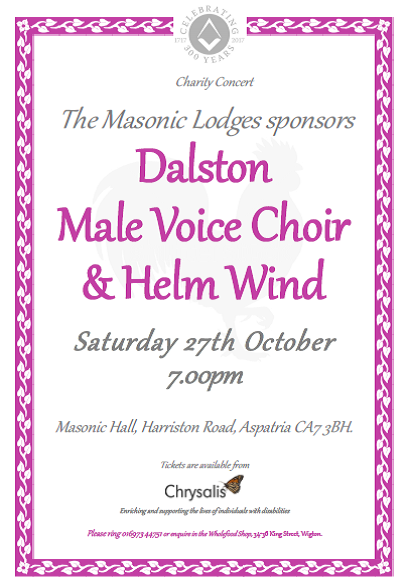 The Dalston Male voice Choir is due to perform in Aspatria on Saturday 27th October at 7pm. Dalston Male Voice Choir was founded in February 1985, with the aims of advancing male voice singing by public concerts and to give pleasure to others while helping charitable causes. You will be treated to a variety of singing from the quartet Close Shave who sing in close harmony, adding variety and fun to concert; The Helm Wind Quintet a newly formed quintet and many more. So join us for an enjoyable musical evening whilst we help raise funds for local charities. You can get your tickets from Chrysalis Wholefood Shop, King Street, Wigton or by calling 016973 44751.